Grubs – Where Do They Come From? Maintaining a sea of green grass may seem impossible, especially if you can’t see what is eating your grass roots. However, with proper lawn care regimen and knowing when to apply grubex, you can achieve a perfectly manicured lawn. Treating your lawn with grub killer like grubex is best for persistent grub infestation. However, the grub killer solutions must be applied correctly at the right time for it to work effectively. Grubs are the larvae of beetles. When they hatch, they will start to feed on the roots of your lawn grass. If left untreated, the grubs can chew and cause damage on huge sections of grass on your lawn. They will continue to infest your lawn and cause damage. They often return the following year to do even more lawn damage. The lawn damage that you see during spring actually occurred the previous fall. The brown patches on your lawn that are caused by grub infestation are often mistaken as dry grass or simply caused by pet damage. You can determine whether the brown patches are caused by grub infestation by pulling up the sod. If the sod remains attached to the soil, the cause of this lawn damage may not be grub infestation. However, if the sod comes up easily when you pull on them, you most probably have grub infestation on your lawn. As you pull the sod, you will also notice white grubs curling into half moon shapes on the dirt. When grubs start to infest your lawn and feed on the roots of your lawn grass, you will notice brown or yellowing areas that come with sparse patches appearing on your once perfect lawn. Aside from the damage that grubs cause, animals that feed on the grubs like raccoons, birds and moles will cause secondary lawn damage by digging holes on your lawn as they seek grubs to eat. If you notice these damages on your lawn, it is time to start treating your lawn with grub killer. So, when is the best time to apply grub killer on your lawn? Timing is the key to an effective grub treatment. Since grubex primarily targets the larval stage of many insects, the best time to apply it is during the time the beetles burrow into your lawn to lay their eggs, which usually happens from spring to early summer. When the eggs start hatching, the grub treatment will kill the emerging larvae, so they will not develop to become mature insects. As a preventive measure, grubex has a residual action that lasts up to four months after it is applied. 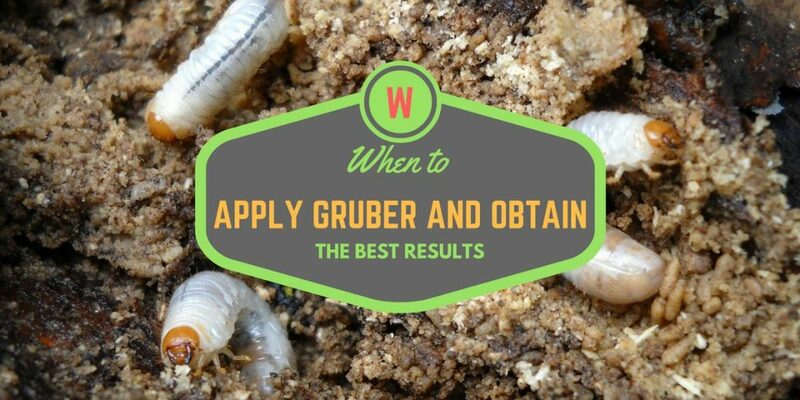 However, the mature grubs that overwinter from the preceding season are not affected by the next season’s application of grub killer. It is recommended to treat each 1,000 square feet of lawn with 2.87 pounds of grub killer once a year. In applying the grub killer, it is ideal to use a drop or rotary spreader, as this can evenly spread the granular pesticide across your lawn. Once the grub killer is evenly applied, you should water your lawn up to a depth of 1/2 inch. This is typically equivalent to 30 minutes of watering. Grubex will not be activated unless it is watered in. As soon as your lawn dries, it is already safe for your pets and family to step on your grass. When you are able to apply the grub killer correctly, you do not have to use additional and excessive amounts of insecticides on your lawn. If you put in excessive amounts of insecticide, it can cause the grubs to become immune to the treatment. Certain areas on your lawn may be more susceptible to grub infestation than others. Grubs often favor the sunny west and south side lawn areas. These areas have warm soils which are favored by grubs as they feed on the roots of the grass. Excessively watered lawn areas during the summer season also attract adult beetles to lay their eggs. Grub killer should also be applied to these areas to prevent any grass lawn damage in the long run. Indeed, timing is the key if you want to get rid of grub infestation on your lawn. Grubex should be applied during the time when you notice beetles on your lawn, as this is the time when they start to lay their eggs. The treatment will kill the larvae once the eggs hatch. Did this article answer your question and cleared your doubts? If so, share this article and help others by educating them on the right time to apply grubex.